Moisés Sierra ... Played for the Dominican Republic in the 2017 World Baseball Classic ... @MoisesSierra88 ... Was signed by the Blue Jays as a non-drafted free agent on December 20, 2005... Scouted and signed by Hilario Soriano. In his second season in Miami's system, hit .294 with 22 doubles, three triples, 11 homers, 68 RBI 39 walks, 18 stolen bases and 52 runs scored in 123 games for Triple-A New Orleans...His 68 RBI and 18 stolen bases were career highs, while his 123 games played were his most since 2011 (133). Named a Southern League mid-season All-Star after hitting .325 with 12 doubles, two triples, eight home runs, 26 RBI and 31 runs scored in the first half of the season...Recorded 25 walks while striking out just 33 times...Recorded a 13-game hitting streak from May 18 to June 2. Spent the entire season with Triple-A Omaha in Kansas City's system. Began his third season with Toronto before being claimed off waivers by the Chicago White Sox on May 3...Appeared in a career-high 96 games between the two clubs...Hit .230 with eight doubles, two triples, two homers, nine RBI and 22 runs scored in those 96 games. Recognized as having the Best Outfield Arm in the International League (AAA) by Baseball America in its annual "best tools survey". Appeared in 100 games for Buffalo, finishing the season with a .261 average with 18 doubles, five triples, 11 home runs, 51 RBI, 57 runs scored, 12 stolen bases and nine outfield assists. Made his season debut for the Blue Jays August 21 at NYY … Started the season going 0-13 after his call-up, but would hit .330 for the remainder of the year after snapping the skid. In September, finished T-3rd in the majors with 12 doubles…Over the month hit .317 with a .385 OBP, .524 SLG, .909 OPS, one triple, one home run, and 11 RBI… Was also T-4th in the AL with 14 extra base hits. Played winter ball in the Dominican Republic, posting a .331 average with four home runs and 21 RBI in 42 games. Made his Major League debut on July 31 at SEA and collected a single in his first at-bat off Jason Vargas... Would go on to play in 49 games in his first season in Toronto... Started 40 games, with 35 coming in RF and 5 at DH...Had seven multi-hit games, including two, three-hit contests... Hit his first home run on Aug. 13 vs. CWS off Jake Peavy, a solo shot that put the team ahead 2-1 in the 7th inning... Recorded a three RBI contest at NYY on Sept. 20...Batted .333 in July, .284 in August, and .157 in Sept./Oct...On Aug. 31 ended the game with an OF assist from RF, throwing out Elliott Johnson at home to preserve a 2-1 win...Played 100 games for Las Vegas in his first season above AA...Posted a .278 average with 17 home runs and 63 RBI... The home runs and RBI were club highs... Hit .302 vs. lefties... Hit .303 before the break and .222 after... Had four hits on June 2 with a double and home run. Spent the entire season at New Hampshire of the Eastern League (AA)... CAREER YEAR: Played in a career high 133 games settling personal highs in runs (81), hits (137), home runs (18), RBI (67) and walks (39)... Was named to the Eastern League Mid Season All-Star team after posting 14 doubles and 13 home runs with 49 RBI prior to the break... Uppedhis average after the break batting .290... CANNON: In a manager's poll conducted by Baseball America, was named BestOutfield Arm in the Eastern League... Registered 11 outfield assists from right field... Had a .923 OPS vs. left-handed pitchingand a .721 OPS vs. right-handed pitching... THREE's A CHARM: Posted three hits in a game on 10 separate occasions... WINTER BALL: Played in the Dominican Winter League, posting a .217 average with one home run and 14 RBI. Only appeared in 20 games last season because of two separate stints on the DL... Began the seasonon the disabled list with Dunedin (A) and was sent on a rehab assignment to the GCL Blue Jays until June 25 when he was reinstated... Only played four games before once again being placed on the DL with a right wrist injury... Was sent on another rehab assignment to the GCL until being reinstated Aug. 31 playing in six games with Dunedin to complete the season. Spent the majority of the season with Dunedin (A) were he would go on to hit .337 (33-for-98) vs. LHP for the season... Was named Organizational Player of the Month for June where he batted .384 (33-for-86) with eight extra-base hits and 19 RBI in 24 games... Was named to the Florida State Mid-Season All Star Game... Was named Florida State League Player of the Week June 8-14 (.423, 5XBH, 9RBI... Was named R. Howard Webster award winner with Dunedin... Was promoted to New Hampshire (AA) Aug. 30 where he played the last eight games of the season hitting .353 (12-for-34)with a home run and six RBI. Spent the entire season with Lansing (A) where he hit .310 in the month of April with two doubles, two triples, two home runs and 11 RBI. In his first season in North America only hit .203 in 43 games with the GCL Blue Jays. In his first professional season at the age of 17 played 69 games with the Blue Jays Dominican Summer League team hitting .253 with four home runs... His first professional home runs came June 13. April 3, 2019 Guerreros de Oaxaca signed free agent OF Moises Sierra. March 21, 2019 OF Moises Sierra assigned to Diablos Rojos del Mexico. January 27, 2019 OF Moises Sierra assigned to Dominican Republic. December 19, 2018 OF Moises Sierra assigned to Tigres del Licey. October 13, 2018 OF Moises Sierra assigned to Gigantes del Cibao. October 2, 2018 RF Moises Sierra elected free agency. August 8, 2018 Moises Sierra roster status changed by Syracuse Chiefs. August 1, 2018 Syracuse Chiefs sent RF Moises Sierra on a rehab assignment to Auburn Doubledays. July 8, 2018 Syracuse Chiefs placed LF Moises Sierra on the 7-day disabled list. May 22, 2018 Washington Nationals sent LF Moises Sierra outright to Syracuse Chiefs. 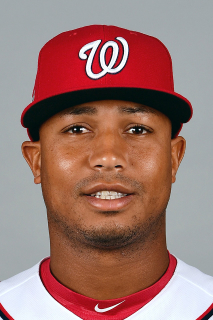 May 20, 2018 Washington Nationals designated LF Moises Sierra for assignment. April 11, 2018 Washington Nationals selected the contract of LF Moises Sierra from Syracuse Chiefs. February 13, 2018 OF Moises Sierra assigned to Syracuse Chiefs. January 10, 2018 Washington Nationals signed free agent OF Moises Sierra to a minor league contract and invited him to spring training. November 6, 2017 RF Moises Sierra elected free agency. April 5, 2017 RF Moises Sierra assigned to New Orleans Baby Cakes from Jacksonville Jumbo Shrimp. March 23, 2017 Miami Marlins optioned OF Moises Sierra to New Orleans Baby Cakes. January 3, 2017 Miami Marlins invited non-roster OF Moises Sierra to spring training. October 20, 2016 OF Moises Sierra assigned to Gigantes del Cibao. September 26, 2016 Jacksonville Suns activated RF Moises Sierra from the 7-day disabled list. July 29, 2016 Jacksonville Suns placed RF Moises Sierra on the 7-day disabled list. Left knee tendinitis. July 7, 2016 Jacksonville Suns activated RF Moises Sierra from the 7-day disabled list. June 25, 2016 Jacksonville Suns placed RF Moises Sierra on the 7-day disabled list retroactive to June 24, 2016. April 6, 2016 RF Moises Sierra assigned to Jacksonville Suns from New Orleans Zephyrs. March 16, 2016 OF Moises Sierra assigned to Miami Marlins. January 30, 2016 OF Moises Sierra assigned to Dominican Republic. January 12, 2016 RF Moises Sierra assigned to New Orleans Zephyrs. December 31, 2015 Miami Marlins signed free agent RF Moises Sierra to a minor league contract. December 22, 2015 OF Moises Sierra assigned to Leones del Escogido. October 16, 2015 OF Moises Sierra assigned to Gigantes del Cibao. October 16, 2015 OF Moises Sierra roster status changed by Gigantes del Cibao. July 22, 2015 Omaha Storm Chasers released RF Moises Sierra. June 2, 2015 Omaha Storm Chasers activated RF Moises Sierra from the 7-day disabled list. May 11, 2015 Omaha Storm Chasers placed RF Moises Sierra on the 7-day disabled list. January 26, 2015 Kansas City Royals invited non-roster OF Moises Sierra to spring training. December 22, 2014 Kansas City Royals sent RF Moises Sierra outright to Omaha Storm Chasers. December 16, 2014 Kansas City Royals designated Moises Sierra for assignment. October 30, 2014 Kansas City Royals activated RF Moises Sierra. October 24, 2014 Kansas City Royals claimed RF Moises Sierra off waivers from Chicago White Sox. August 31, 2014 Chicago White Sox activated RF Moises Sierra from the 15-day disabled list. August 25, 2014 Chicago White Sox sent RF Moises Sierra on a rehab assignment to Charlotte Knights. May 4, 2014 Chicago White Sox activated RF Moises Sierra. May 3, 2014 Chicago White Sox claimed RF Moises Sierra off waivers from Toronto Blue Jays. May 1, 2014 Toronto Blue Jays designated RF Moises Sierra for assignment. October 19, 2013 OF Moises Sierra assigned to Gigantes del Cibao. August 21, 2013 Toronto Blue Jays recalled RF Moises Sierra from Buffalo Bisons. July 22, 2013 Moises Sierra roster status changed by Buffalo Bisons. July 18, 2013 Buffalo Bisons sent RF Moises Sierra on a rehab assignment to GCL Blue Jays. July 4, 2013 Buffalo Bisons placed RF Moises Sierra on the 7-day disabled list. March 3, 2013 Toronto Blue Jays optioned RF Moises Sierra to Buffalo Bisons. December 26, 2012 OF Moises Sierra transferred to Toros del Este from Gigantes del Cibao. October 13, 2012 Moises Sierra assigned to Gigantes del Cibao. July 31, 2012 Toronto Blue Jays recalled Moises Sierra from Las Vegas 51s. March 14, 2012 Toronto Blue Jays optioned Moises Sierra to Las Vegas 51s. September 29, 2011 Moises Sierra roster status changed by Toronto Blue Jays. March 13, 2011 Toronto Blue Jays optioned RF Moises Sierra to New Hampshire Fisher Cats. November 19, 2010 Toronto Blue Jays selected the contract of Moises Sierra from Dunedin Blue Jays. August 31, 2010 Moises Sierra roster status changed by Dunedin Blue Jays. August 21, 2010 sent OF Moises Sierra on a rehab assignment to GCL Blue Jays. July 4, 2010 Dunedin Blue Jays placed OF Moises Sierra on the 7-day disabled list. June 25, 2010 Dunedin Blue Jays activated OF Moises Sierra from the 7-day disabled list. June 21, 2010 sent OF Moises Sierra on a rehab assignment to GCL Blue Jays. April 7, 2010 OF Moises Sierra assigned to Dunedin Blue Jays from New Hampshire Fisher Cats. March 8, 2010 CF Moises Sierra assigned to Toronto Blue Jays. October 16, 2009 OF Moises Sierra assigned to Gigantes del Cibao. August 31, 2009 RF Moises Sierra assigned to New Hampshire Fisher Cats from Dunedin Blue Jays. April 9, 2009 Moises Sierra assigned to Dunedin Blue Jays from Toronto Blue Jays. December 20, 2005 Toronto Blue Jays signed free agent OF Moises Sierra to a minor league contract.